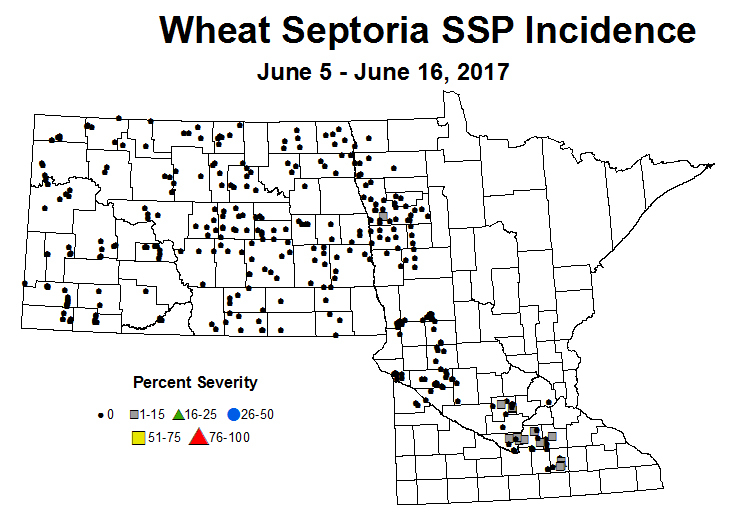 The newest small grain scouting maps are posted on line. In many areas applications are now being made for late season leaf disease, and Fusarium head blight. Leaf rust has been found with low severity and about 20% incidence in Nicollet, La Sueur, and Grant Counties. Rusts are also starting to appear in trials at the Northwest Research and Outreach Center. Septoria spot blotch is now beginning to be visible in many fields. Areas with high humidity will continue to see these diseases progress over the next week. Areas which have suffered hail damage may be at risk from Bacterial leaf streak (BLS). However, symptoms will not be obvious for several weeks. Remember that spraying fungicide for BLS is not effective as it is a bacterial disease. In considering Fusarium Head Blight control, check if the variety is a moderately resistant or susceptible variety (check the variety trials guide). Risk should then be checked using the FHB forecasting tool. Caramba and Prosaro are some of the best products to control FHB and mycotoxin levels. However, with low risk and a moderately resistant variety, tebuconazole containing products (e.g. Folicur) can also be considered. Application should be made at early flowering (GS Feekes 10.5.1). However, if this window is missed, spraying 5-7 days post flowering can also have some efficacy and is more efficacious than spraying before flowering begins.Watch pre-harvest intervals on products if making later applications. DO NOT use products that contain strobilurins for control of FHB as they may elevate DON levels. Aphid population levels continue to be below the threshold of 85% of the stems with at least one aphid present. 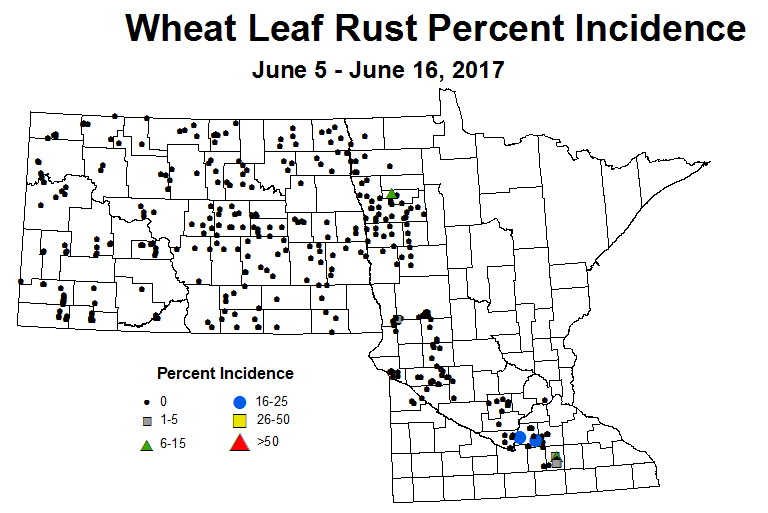 The wheat crop is growing fast and will probably outpace the risk from cereal aphids. Wheat fields surveyed showed that most of the wheat crop is in the jointing to boot crop stages. The greatest risk of yield loss from aphids feeding on grains is in the vegetative to boot stages. After the onset of flowering, significant yield are not expected to occur from aphid feeding injury. Anticipate more aphid detections in the northern most wheat fields in coming days. 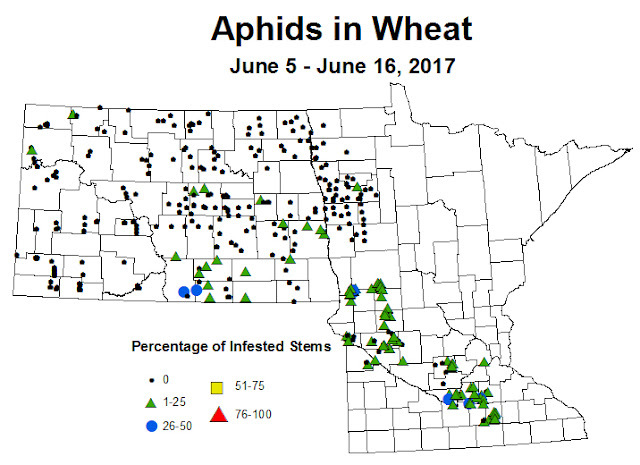 Any later planted, younger fields will be at greater risk for aphids as they will become quite attractive to any migrating cereal aphids.